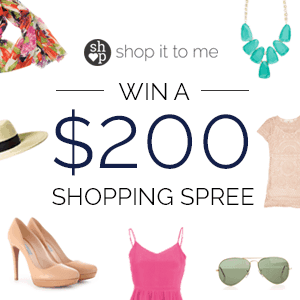 I’m thrilled to bring you guys the chance to win a $200 shopping spree from one of my favorite shopping services, Shop It To Me. As always, SITM is a free, personalized daily shopping update for clothing, shoes, and accessories — just tell them your favorite designers and brands, and they do the legwork by searching hundreds of online stores to find them — on sale — in your size(s). They also have a killer new iPhone/iPad app that lets you easily “favorite” things in your SITM collections, find them again — and they even send you price drop alerts by email when your favorites go on sale. To Enter: Readers enter the giveaway by a) signing up for SITM and b) then leaving a comment, on this post, leaving the email address you used to sign up in the email field — it will only be visible to Corporette staff. (Readers who are already loyal users of SITM, you can just do part B). One winner will be chosen the morning of Tuesday, May 20 (chosen by Corporette staff and Random.org) and win a $200 shopping spree with Shop It To Me. Please note that, due to legal reasons, this contest is only open to adult residents of the United States. The winners will have one week to respond to Kat to claim their prize or a new winner or winners will be chosen. Disclosure: Corporette® charges advertisers a fee to promote giveaways. I agree! Can I enroll the manageing partner? After all, he is the one that is doeing all of the reimburseing, and if he get’s something, he also can buy stuff for Margie! I am very aware how luckey I am so I am nominateing him also. YAY!!!!! Big fan of the daily SITM emails. Yay! Shopping spree for free!!! Already a fan of Shop It To Me! I definitely would not say no to a shopping spree! Love it! signed up with [email protected]. Thanks so much. This looks really awesome! The mostly broke law student in me is crying about the prices, but still, awesome. Wow — I’ve never heard of Shop It To Me! But I am super excited to try it. Thanks for the giveaway! Great idea. Introduced to SITM a while ago through this site and love it! I could use a spree!